Hi Stampers, I took a week off to celebrate my BIG birthday last week. I am back now and ready for another hop. Today I am using the Fresh Fruit Stamp set again. I love the versalitiy of this set. I have used the peach and the flower in other posts so today I decided to try out the darling pear. Can I just say, this is one on my favorite sets! The Pears: Fresh Fruit Stamp set and the inks are listed below. Pear: The outline is Old Olive and the solid pear is stamped in Pear Pizazz. A Linen Thread bow and rhinestone complete the pear. The dots: The large dot is stamped in Old Olive and the small dot is in Pear Pizazz. The leaves: The outline is Early Espresso ink and the solid image is stamped off Early Espresso. The flowers: I stamped them in Daffodil Delight and then with my sponge dauber I sponged the edges with Crushed Curry and added a touch of Old Olive in the middle. A Early Espresso dot completes the flowers. After the flowers and pears were all stamped, I fussy cut them out and adhered them to my card. The top pear was put on with a dimensional to all depth to the card. The bling: Daffodil Delight Enamel Shapes and a few Pearls and Rhinestones complete the card. I love to see a surprise when you open the card so, I stamped the pear on the inside and added the sentiment from the Fresh Fruit stamp set. While I was at it I also stamped the front of the envelope too. To visit the other team members blogs just click the “go to the next blog” button and have fun on the hop today. 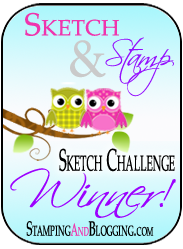 This entry was posted in Stampin Up Fresh Fruit, Uncategorized. Beautifully created Kristi! Great layering and design. Perfect colors too! Thank you Amy. I made a few different cards and settled on this design. Thanks Jari, I love this set! Thank you—love the color combination and the effect of that particular EF . Thank you, I love how embossed paper just adds so much to a card. Thanks Mary, it is good to be hopping again. Had a wonderful birthday though. Love love love it!! Great design and fabulous colours you chose ! I will have try this one out!